■ These birdhouses are made from a unique blend of 75% pine sawdust, burnt clay and other natural materials, formed and baked to provide a nesting home for birds ■ Provides a healthy environment for them and which will last for 20 years or more in your garden. ■ This remarkable material actually "breathes" like wood. Yet it is completely rot proof. ■ The non-toxic brown paint on the roof and sides sheds water like a duck's back. ■ Resistant to damage by squirrels and raccoons. ■ 1-1/4" hole for wrens, chickadees, nuthatches, titmice, small woodpeckers. ■ 1-1/2" hole for Eastern Bluebirds, tree swallows. 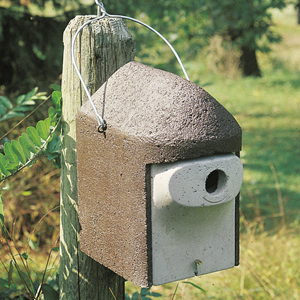 ■ Long reach from front of box puts nest at rear beyond reach of cats or squirrels. ■ 1/2" high, 7" wide, 9-1/2" long. 18" overall inc. hanger, 14 lbs.